Last Friday, Chris Parsons of Eden Development announced the release of Pin in the Map. Chris was the author of one of my favorite Google Earth network links - the Global Cloud Map (which lets you see the clouds on the Earth from near real-time satellite photos). The concept of Pin in the Map is targeted to make it as simple as possible to mark a place on the Earth and share it. This is something I've seen done very well before with Tagzania, so I struggled to think of a way to explain how this was different. Stefan at OgleEarth popped up with a story and he described it very well: Pin in the Map is like TinyURL for location. With Pin in the Map you don't need to set up an account. 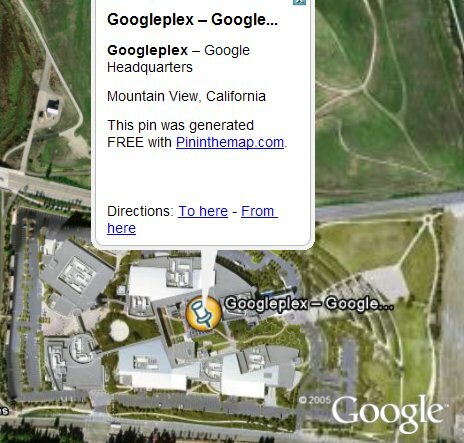 You simply find a location you want to share with Pin in the Map's Google Maps, then simply click to put in the pin. Type in a description (there are some text formatting features available). And you're done. You are given a pininthemap.com url which includes a unique code. If you attach "/earth" to it you have a link to the same spot in Google Earth. 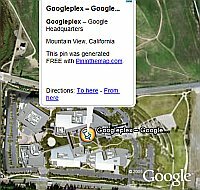 For example, here is a link to the Googleplex for Google Maps, and for Google Earth . The URL is this: http://pininthemap.com/pp05b23afcbcf2a2cd8. Pin in the Map also plans to offer a premium service. The two key features so far for the premium service will be to get rid of ads appearing around the map, and to have your own custom URL like: http://pininthemap.com/googleplex> (for example). Tagzania has a much more powerful interface with many more features, and you can get a readable URL (once you set up a free account) by simply creating a tag (for example http://tagzania.com/tag/googleplex). But, there's always room on the Internet for even simpler interfaces. Great work Chris. Frank neglected to say that he provided a good deal of helpful feedback when I was developing this app. I've been working on a project like this. I thought I was keeping it simple. I really like this though, my favorite so far. It might even edge out my own project. It's like pastebin for maps. Awesome! It allows multiple point plotting, optional data overlays, embedding into websites or forum posts, etc.